Business Tianjin Magazine - Magazine FEATURE STORY: The Rise of the ‘Redback’: A Future of Chinese Global Currency Dominance? 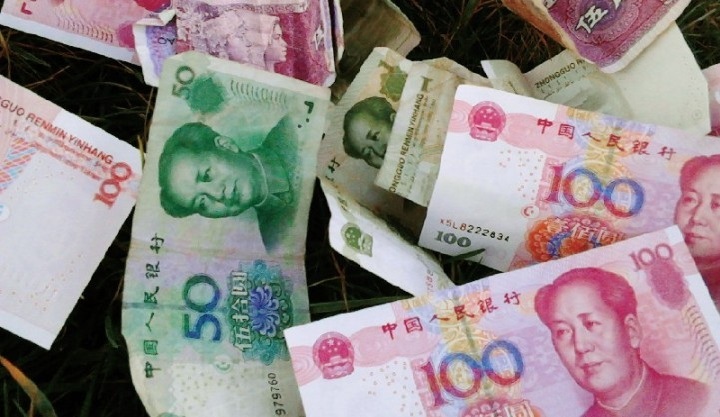 FEATURE STORY: The Rise of the ‘Redback’: A Future of Chinese Global Currency Dominance? The internationalisation of the Chinese Yuan (also known as the RMB) has been a prominent talking point in financial circles for some time now. Economists, bankers and even government officials cannot say with any certainty how and when it will happen. But one thing is for sure, at some point in the not too distant future the RMB will play more of a role within the global monetary system, and the process of integrating the Chinese currency into foreign financial markets has already begun. What does this mean for China, and how, if at all, will the internationalisation of the country’s sought after currency effect the global balance of economic power? Whilst it is almost inevitable that China will allow its currency to float relatively freely at some point in this decade, it has thus far, and no doubt will continue to be, a long process with many policy considerations to work through beforehand. It all started in 2008 when regulators in mainland China started to allow certain firms to put RMB valuations on their export products. Since then authorities have taken significant steps towards making Yuan denominated assets available outside the mainland. Today, Hong Kong is the major hub for off shore Yuan transactions and it is thought that there could be over CNY 1 trillion deposited there at the moment. Many analysts see the thriving financial metropolis as a testing ground for small scale currency internationalisation experiments. Furthermore, now that this market place for China’s off shore currency is up and running, policymakers are currently negotiating a series of deals which will make London the first non Asian international hub for the RMB. Following a recent meeting between the Bank of England Governor Mervyn King and his Chinese counterpart, it was announced that the two countries will engage in a colossal currency swap at some point in the near future. The move is just the latest in a very long series of developments by which China is edging closer to having a fully convertible global currency. 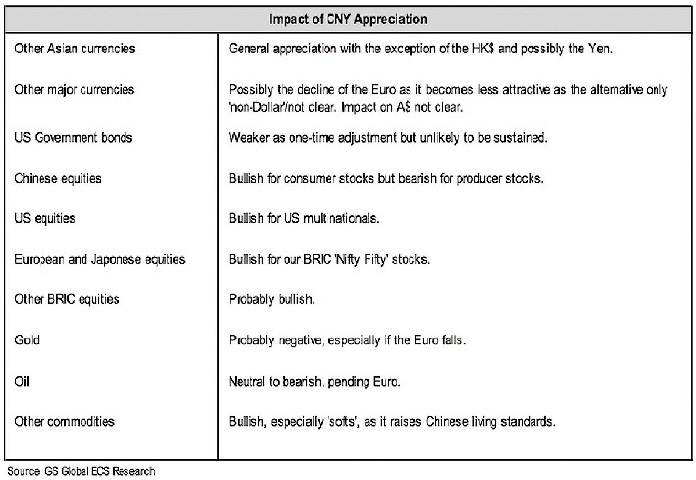 Is appreciation of the RMB really a one way bet? Despite the historical significance of the current developments, the main reason why financially minded people are getting excited about the future of the Yuan has more to do with the prospect of big profits from significant long term value increases against other major currencies. The consensus view amongst foreign investors and economists until now has been that the Yuan is, to some unknown extent, undervalued against the Dollar, and therefore if the regulators allow the currency to float freely then it will appreciate as speculators move in to buy it up in bulk. Given the state of the Chinese economy- particularly in comparison to Europe and the US, it is easy to see why so many commentators are supporting this view. Even if one simply goes by GDP growth rates and the enormous trade surpluses that China has built up in previous years, it seems fairly obvious that the value of the country’s money is in relatively good shape. Nevertheless, there is also a chance that investors are letting their excitement get the better of them. Amongst other factors, the probability of a ‘hard landing’, or at least some sizeable economic shocks, happening at some point in the next few years remains moderately high. There is also the fact that the Chinese government have already allowed the Yuan to appreciate for several years. By the time it becomes available for large scale speculative investments its value may have reached or even surpassed its realistic levels of value against other currencies. Therefore, the ‘one way bet’ theory may well run out of credibility as time goes on. The Yuan as a new world reserve currency? As Chinese policymakers move ever closer to a fully integrated Yuan, many economic thinkers are touting the end of the US Dollar’s status as the world’s most popular reserve currency. During a recent interview with Business Tianjin, renowned economist and president of Euro Pacific Capital Peter Schiff claimed that “the Dollar is doomed and eventually the world is going to wake up and realise that the best way for people to preserve their wealth is either by purchasing gold or obtaining assets denominated in RMB or other emerging currencies”. And while many others share Schiff’s pessimistic outlook for the Dollar, not all commentators are so confident that the Yuan will eventually eclipse it on the international stage. Eswar Prasad, Professor of Trade Policy at Cornell University, argues that the main reason why the Chinese Renminbi is unlikely to become the world’s largest reserve currency is the shortcomings of the country’s financial markets in comparison to that of other economically powerful nations. He points out that although China has the size and relatively stable macroeconomic policy framework to make the Yuan a very important currency, “the success of the Swiss Franc proves that the most important factor is not how big the economy is or how fast it is growing; it is having deep and liquid financial markets to absorb external supply and demand shocks”. In this regard it is definitely the case that China has a long way to go before it parallels the financial infrastructure of the US, or even countries like the UK, Japan and Switzerland whose currencies are also very important on the world stage. Even if the Yuan does eventually become the world’s leading reserve currency and/or it appreciates significantly over time over time, the question people will be asking is whether or not it is beneficial for China. 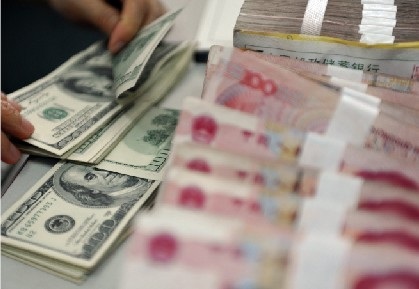 On the plus side, if the rise of the US Dollar is anything to go by, a globally dominant Yuan could give China more flexibility over its monetary policies, improve growth in areas such as financial services and it would undoubtedly give the country a louder voice on the international stage. On the other hand, whilst this would all be beneficial to China in the short term, there are plenty of reasons why a global reliance on the so called ‘Redback’ may be more trouble than it is worth. 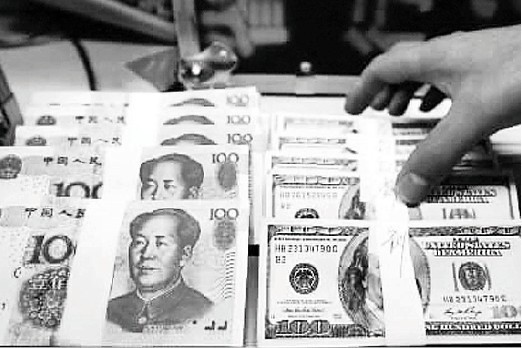 First of all, allowing the Yuan to have a greater role on the world financial stage also inevitably means leaving large amounts of China’s monetary base in the hands of foreign parties. In a stable, low inflationary environment that shouldn’t be too much of a problem. However, if and when things turn sour this would restrict China’s ability to manage its fiscal and monetary policies. Additionally, for the Yuan to maintain its position as the world’s reserve currency it would be faced with what the economists call the ‘Triffin Dilemma’. The central premise to this concept is that when there is a large demand for a currency beyond national boundaries the issuing country becomes compelled to produce more money, and doing so causes a conflict between domestic and foreign monetary policy; a paradoxical situation of this kind would be severely disruptive to a developing economy like China. Whilst the Chinese authorities are clearly moving towards this goal, the internationalisation process is very much a waiting game for now. If China is to have a currency which is fully convertible and is important on the world stage, it will first need to enhance its financial infrastructure, deepen its capital markets and most importantly, carefully consider new strategies to deal with speculation.